Your device is way too small to view our website! Please use a newer mobile device or desktop to shop our website. If you do not have access to one of these, you can contact us to place an order at 800-504-5989 M-F 8am-5pm CST, or sales@floorregisterresources.com. Permanent Air Filter Discounts Apply ! These reusable furnace filters are very eco-friendly and easy to clean. The permanent air filters also work better than your traditional disposable air filters. These aren't just reusable furnace filters, they can be used in return filter grills and any other HVAC filter needs. To clean the reusable furnace filter just vacuum out loose dust and dirt from the permanent air filter and rinse out in a sink or with a hose and re-install to the return filter grill. Because reusable furnace filters are made with natural fibers, an electrostatic charge is created. This causes the filter to catch two and a half times more dirt and dust than glass fiber disposable filters. 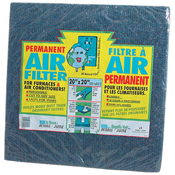 These permanent air filters are one inch thick and come in four common sizes; 20x20, 20x25, 30x12, 30x24. However, you can easily cut them down to whatever size you need, making them a great choice for those odd sized filter grills. Order today to get a better quality air filter that will last for years to come. A Division of Floor Resources LLC © 2014; No hotlinking, copying of images, code, or text is allowed.